THE CALLIOPE - 'Streets Of Boston'/'Awosting (The Truth)' (Audio Seven MG 152/154) 196? 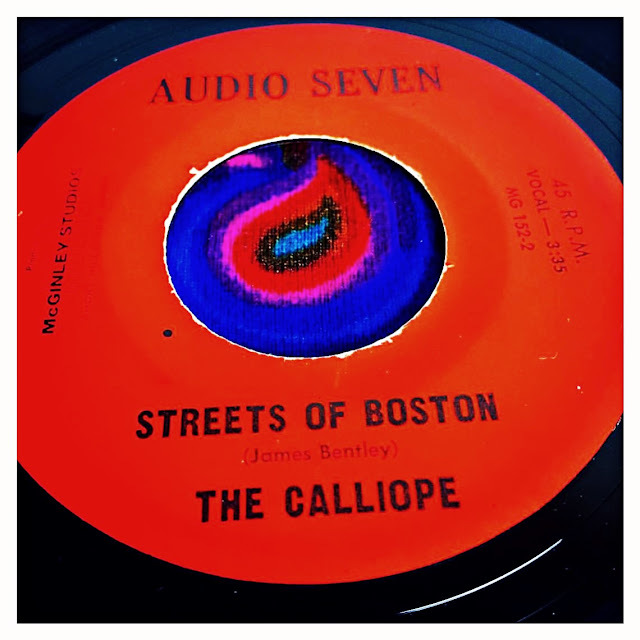 Probably the most well known Calliope 45 is the crude garage psycher 'Streets Of Boston' which was compiled on the early 80s LP 'Attack Of The Jersey Teens'. Notable for it's primitive guitar riffs and clattering tambourine throughout. I think it's a monster of a song but it rarely gets talked about. 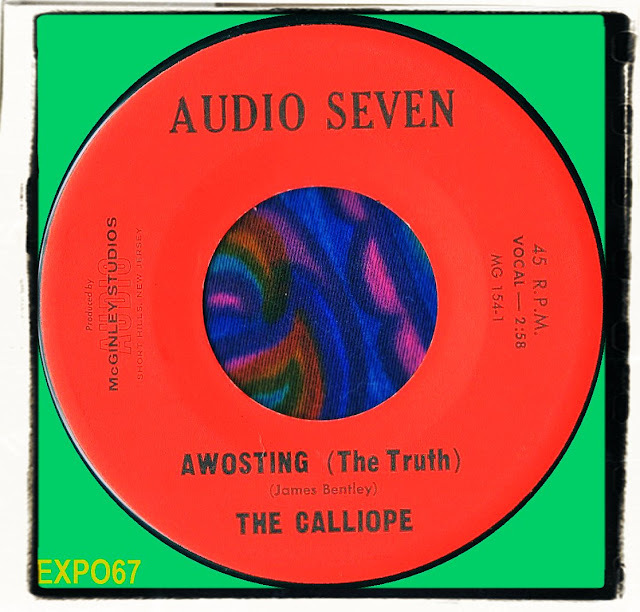 The flip 'Awosting (The Truth)' is an atmospheric psychedelic ballad with one of those strange song titles that needs investigation. At first I thought it could be simply a typo on the label and should have read 'Awaiting (The Truth)' but I soon realised with a spot of googling that Awosting is a place in New Jersey. Once again, both songs were written by James Bentley. His skill at writing introspective psych songs makes him one of my 'Flower Bomb Songs' minstrels and someone I'm sure would have went onto other music after Calliope ceased to be. I've recently made contact with Jimmy Bently, the leader of The Calliope and he provided me with the following information. Jimmy: "To answer your question on the word "Awosting." It is a town in northern New Jersey, USA (I live on the New Jersey Shore) I first saw that word on a friend's T-shirt, and it cracked me up, so we used it to mean "Party"! "Streets of Boston"---the first "Drum Sound" you hear was a "Drum Machine" or "Rhythm Ace" (very old-fashioned & "corny") it sounded so humorous, had to use it! we turned it up loud so it would distort! then I screamed out "Look out! It's the mad Armenian Monsters, oh no! all tunes recorded in Short Hills,NJ, USA"
I just find it pretty cool that after all these years (50) I find them on youtube, posted by a guy from England! I love it!" Good Tune! Thanks for Posting! For me, this is about as good as it gets, and an awful lot better than it's A side, plus the drummer seems to have taken his medication this time. Just the mearest feel of one of Arthur's ballads or even a Bryan Maclean touch, but hard to describe as it is pretty unique. This is why so many of us follow your postings Colin, you truly do have the most far out sounds. As ever many thanks!